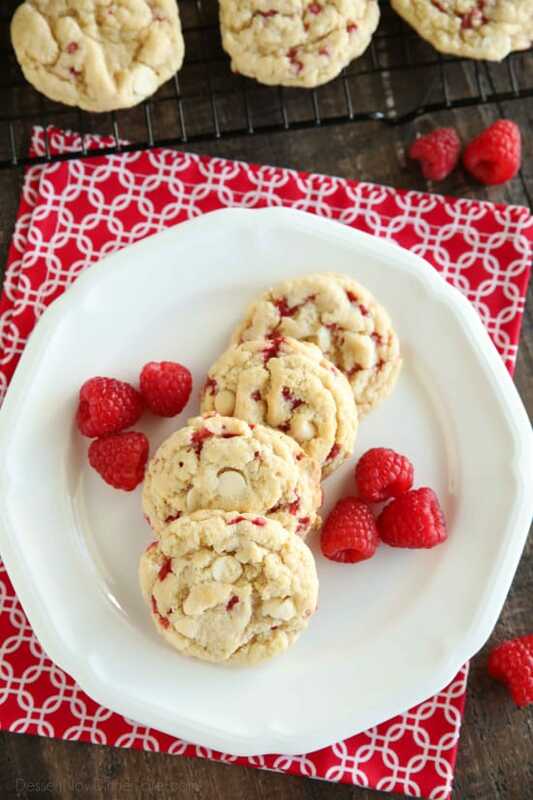 Raspberry Cheesecake Cookies - Dessert Now, Dinner Later! I re-made these cookies along with my blueberry cheesecake cookies for the fourth of July, and took the opportunity to re-photograph them. My original image below (from 5 years ago) wasn’t that bad, but it’s always fun to update some old pictures. It really is a shame I don’t get to make my older recipes very often. I’m always trying new ones, but that doesn’t mean I love them any less. 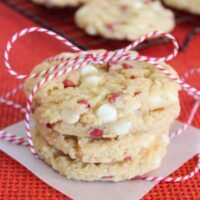 These raspberry cheesecake cookies were just as delicious as I remember them. It’s been a while, but I’m happy I had the excuse to make them again. 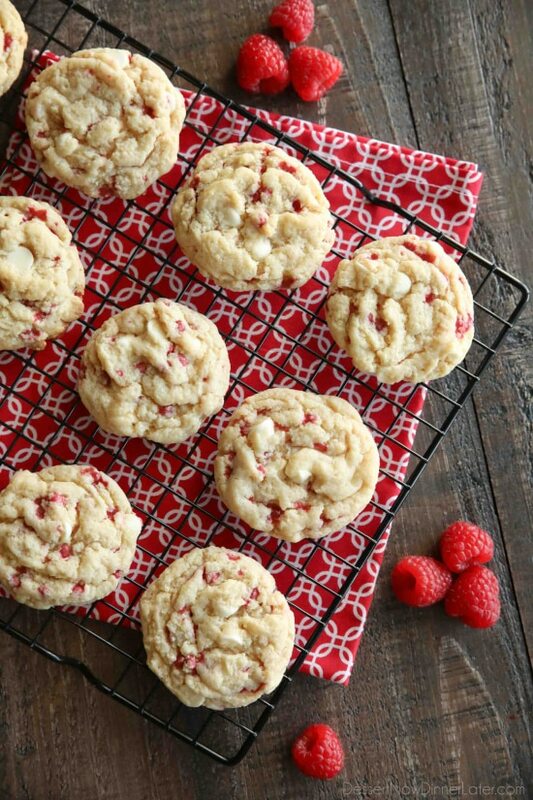 These raspberry cheesecake cookies come together quickly because they start with a muffin mix! It’s a super versatile recipe. Just use your favorite flavor of muffin mix. 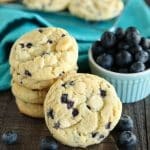 Cream cheese in the batter makes the cookies soft, tender, and chewy. 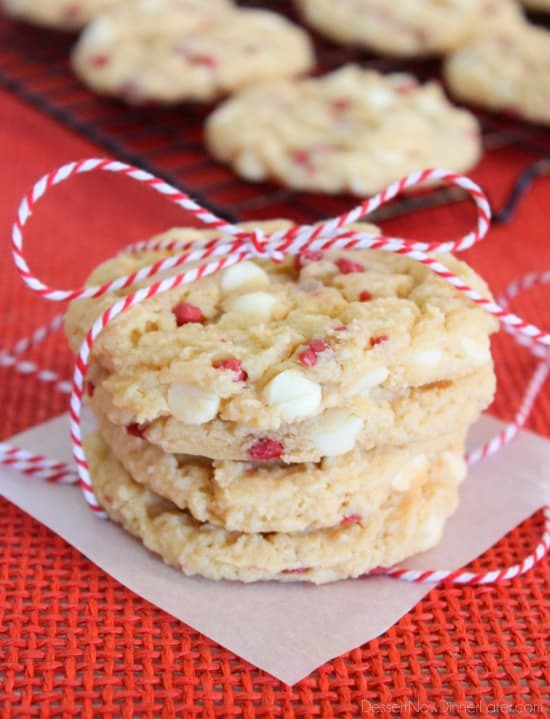 White chocolate chips add just the right touch of sweetness and richness. Talk about a semi-fancy, high-class cookie to share with friends! Apparently these are similar to the raspberry cheesecake cookies from Subway too! Awesome! Cream the cream cheese, Crisco, and brown sugar together. Add the egg and vanilla. Blend. Scrape bowl. Add muffin mix and flour. Mix until just incorporated. Fold in white chocolate chips. Scoop 1½ Tbsp balls of dough onto parchment lined baking sheets. Bake at 325 degrees Fahrenheit for 14 minutes. *Originally Published 7/23/13. New photos added and post updated 7/5/18. Oh my gosh Amber, these cookies look phenomenal! I love cheesecake and I love raspberries – in cookie form? yum yum yum!! Ps your pictures are so cute! Love the string and bow! Perfectly made cookies! They look lip licking! Thanks Katerina! They are a new favorite for sure. I highly recommend trying them! 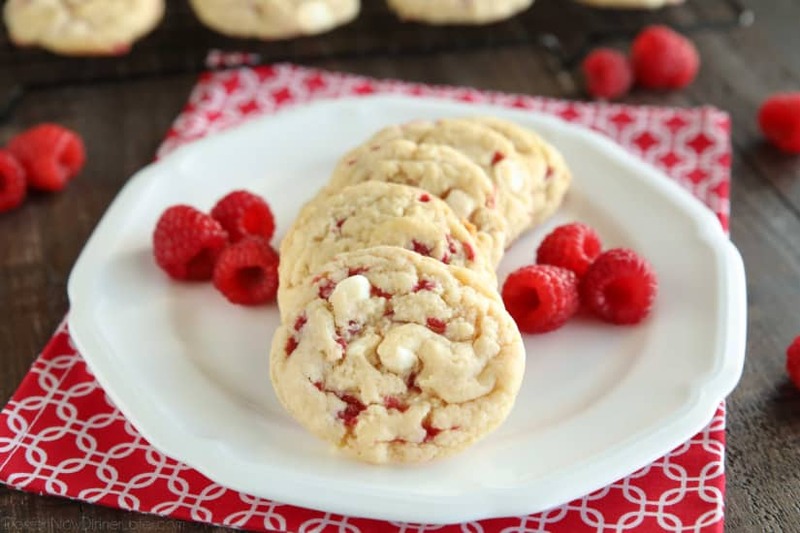 Raspberry and cream cheese is the perfect combination for cookies! Jessica, you are so right! And these are fabulous! These look so great Amber! Cookies are definitely my downfall in the kitchen. They never turn out just right, but maybe I’ll have to give these a whirl! Raspberry and cheesecake is my husband’s favorite combination, and our anniversary is coming up soon. I might have to make these for him! Cookies are one of my very favorite things to bake. I go NUTS around the holidays! Another delicious looking recipe, especially since I love Raspberry and white chocolate together. And not a ton of ingredients, either, which is ALWAYS nice. I am definitely going to have to try these! I love cheesecake! Oh my. These look so amazing! I can see these in my kitchen in the near future! Just found this recipe on Pinterest & I was so leery of making another Pinterest recipe because they all have turned out HORRIBLE! But I am so glad I gave it another shot…. LOVE this cookie! We are actually make it for a wedding this Saturday as an addition to the dessert table. Thank you so much! You can, they might spread more though, since butter has more moisture than shortening, so try adding a little extra flour & do a test cookie before baking them all. Thanks Jasmine! We love them as well! I’m going to a cookie bake off tomorrow and I’d love to make this! however time is running short tomorrow, would the batter be okay if I made tonight, put it in the fridge and than baked tomorrow at the bake off? YES! The original recipe that I altered actually requested refrigeration before baking, but I tweaked it so it wouldn’t need it. 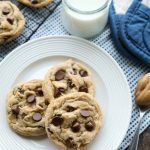 Just take out the cookie dough maybe 15-20 minutes before you want to bake it so it can come to room temperature or do a test cookie cold from the fridge. My daughter-in-law made these for a cookie exchange party, and they were wonderful. I can’t wait to make them myself. That’s wonderful to hear! Glad you liked them! I just made these, they are simple and yummy! Even the batter smells good! Tanks for the recipe!! I made these and they magically disappeared from my kitchen faster than I expected. The only thing I noticed was I ended up with 4+ dozen from this recipe, not 2 dozen as stated. 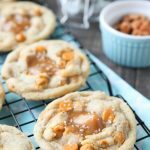 Not a big deal, actually it worked out very well, since these proved to be one of my most popular cookies. Thanks! Wow, that’s awesome! Thanks for stopping by to share your success! Raspberry Cheesecake? That sounds amazing! Thanks for sharing! One of the best cookies I have ever made. I’ve shared this recipe with a few people & everyone says the same thing-delicious!!!! That’s so great! Thanks for coming back to share your review! I don’t have rasberry cake mix! Aaaaaaaaaaaaaaaaagh. I have fresh rasberries. This is ruining my life. I am going to tweak my other recipe and incorporate this somehow. Please pray for me. I need this cookie. Hi Amber, I’ve been searching for a “special” cookie and these look amazing. Want to make them for my son’s rehearsal dinner in Cape Cod. Was wondering how long they will stay fresh and if they have to be refrigerated ? Hi Theresa, thanks for your compliments! This cookie is a fabulous one! They don’t need to be refrigerated, just store them in an air tight container and it’s best if you eat them within to 3 or 4 days. Enjoy! I have never used Crisco butter flavored sticks. The box says you add two two tablespoons water. Do you have to add the water for this recipe? It’s been a long time since I used the sticks instead of the jar/tub of crisco, but I always just use it straight as it comes packaged; no water. Enjoy! That’s so great! Thanks for your review! Shortening isn’t available here in Australia. Is there an alternative that would work.? Coconut Oil would be a great substitute. I want to make these for Valentine’s Day. Question is, do you think it’ll be okay to use a cookie cutter? Might be tricky to cut with the white chocolate chips, and they spread like a regular chocolate chip cookie, so it probably isn’t the best idea, but you can experiment if you’d like. Betty Crocker and Martha White have a wildberry muffin mix that is similar. You can chop up some dried cranberries too. 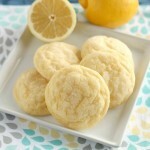 I wouldn’t add too much lemon juice because it will make the cookie spread more. Maybe 2 Tablespoons. If it’s really wet, add a Tablespoon or two of extra flour.